Since the launch of its Sustainable Backyard program in 2014, Sustainable Solano has created 15 food-producing, self-sustaining demonstration “food forest” gardens across Solano County on both public and private land. These gardens are primarily irrigated by secondary water sources (diverted roofwater, laundry-to-landscape greywater systems). The food forests are designed based on a permaculture design system of food production that utilizes the wisdom inherent in natural woodlands and the understanding of beneficial relationships between plants to create and support landscapes that grow food for human use. The program officially expanded to Vacaville in mid-August. Since the launch, sustainable landscape classes have been offered to Vacaville residents covering sustainable landscape design, wise-water practices and permaculture. On Saturday, October 13th, residents will have a hands-on opportunity to help create Vacaville’s first private demonstration food forest garden, alongside their community, by attending the first demonstration installation workshop. 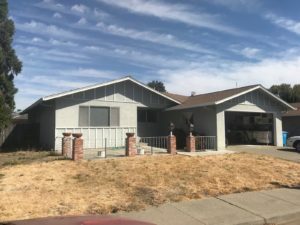 The selected homeowner is a long-time Vacaville resident with a vision to transform his front yard from barren, dead grass to an oasis of edible and beneficial trees and plants. This demonstration food forest garden will be named “Healthy Futures” with the goal of providing nourishment and serve as a community asset to learn about sustainable landscaping. All are invited to help transform this lawn into a thriving ecosystem fed by secondary water sources. The garden will take three full days to complete and each public installation workshop will be hands-on. This first workshop will focus on digging swales, diverting roofwater, planting fruit trees and sheet mulching to increase water-holding capacity and improve soil health. On Saturday, October 20th, with the guidance of Greywater Action, attendees will learn about greywater use and how to install a laundry-to-landscape system that diverts water from your washing machine to your garden reducing the need for potable water irrigation. Day three, Saturday, October 27th,, will wrap up the project with attendees planting a community of plants with multiple functions that support a healthy, diverse ecosystem, installation of water efficient in-line drip system. The selection process for these sites are based on criteria such as yard access, greywater feasibility and sun orientation. Sites are assessed and selected by Sustainable Solano’s Advisory Board made up of dedicated Solano County residents aiming to raise sustainability awareness in Solano County. There will be yearly ongoing workshops and tours of these demonstration food forest gardens on private and public land in each city. This project is made possible by funding and support of the Solano County Water Agency.